The lyrics and even the action of the Ring Cycle are a series of repeating stories in which different characters retell past and future moments, all of which move inexorably toward the culminating deaths in Götterdämerung, the cycle’s concluding opera. It’s almost as if Wagner was worried the audience might forget the storyline during the cycle’s 17 hours of high-octane emotion. More likely, he was just obsessed, a living paragon of Romantic excess. Of the many stories sung, Wotan’s retelling of Das Rheingold is the most startling. Overlooking the urban landscape in Die Walküre, he confesses his faults to his favorite daughter Brünnhilde. Having tired of love in his youth, Wotan turned to conquest. Unlike the evil dwarf Alberich, however, Wotan cannot deny love entirely, or live for power alone – a vow needed to keep the Rheinmaiden’s gold, which has been stolen by the giant Fafner. The goddess of Earth, Erda, warns Wotan that his and Alberich’s desire for the Rhein gold will bring catastrophe. Greer Grimsley (l.) as Wotan tried to block Siegfried (Daniel Brenna) from saving Brünnhilde. Photo by Cory Weaver. To ward off that disaster, Wotan created the Valkyries and engendered the love between Siegmund and Sieglinde so that a hero would be born to save the gods and Valhalla. The hero Siegfried can murder the possessor of the gold, while Wotan’s pacts with Fafner prevent him from doing so. The contradiction lies in Wotan’s attempt to unite the twins; by doing so he has compelled them and manipulated fate. For this he is ultimately responsible and the true betrayer of the giant Fafner, whom Wotan owes for building Valhalla. Further, by letting Siegmund live and engender a son in an adulterous love with his sister, Wotan shames Fricka, his wife and the goddess of marriage. Wotan wants Brünnhilde to let Sieglinde’s cuckolded husband Hunding kill Siegmund in battle. Complex and psychologically dense, the story moves backwards and forwards in time, revealing levels of betrayal unapparent in Das Rheingold. And adding multiple ethical conundrums into the story. Brünnhilde at first refuses; she sees that Wotan loves Siegmund. For her, his murder is a betrayal of Wotan’s heart, an oddly contemporary attitude in an archaic world of power, status, contract and honor. Brünnhilde, susceptible to love, lets Siegmund live. 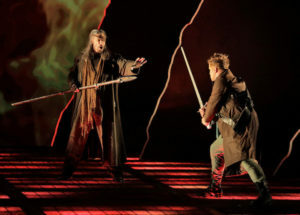 Wotan strikes him down and punishes Brünnhilde by stripping away her divinity and leaving her asleep, surrounded by acidic green flames on a distant mountaintop, until a hero can awake her. Disobedience is the worst betrayal in the patriarchal warrior world. The reviewer sitting next to me during Götterdämmerung told me Siegfried was his favorite opera because everyone gets what they want. Wotan gets his hero, Brünnhilde gets Siegfried and Siegfried gets Brünnhilde, a past, the Ring and endless opportunities for adventure. One can even say that the dragon Fafner, wittily portrayed as a huge tractor with claws, is happily put out of his misery. Daniel Brenna as Siegfried reforges the sword Nothung. Photo by Cory Weaver. 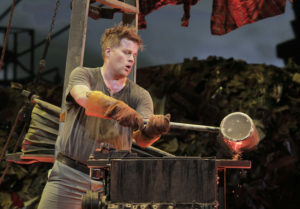 Tenor Daniel Brenna made his company debut as Siegfried. In this production the character is childlike, a brazen 17 year old, full of testosterone, all muscle, beauty and little brain – the usual hero type. He provides an excellent vocal match to the intensely focused and vocally gorgeous Iréne Theorin as Brünnhilde. And the confrontation between Greer Grimsley as Wotan and Brenna as the reckless hero allows Grimsley a scene of transcendent authority, dramatically and vocally. The ending scene of Siegfried between Brenna and Theorin was pure Wagner, a ceaseless seduction and sexual giving-over sustained by an agony of suppressed desire and slow crescendo. Here, Brünnhilde embodies the struggle between power and love; in her role of Wotan’s wishmaiden she is a manifestation of his will, and her submission to her own desire requires abandoning her separation, self-control and sovereignty. Theorin projected the wildness of her first appearance in Wotan’s Valhalla into a contained and restless passion, compelling us to submit in turn to Wagner’s music. In contrast to Siegfried, Götterdämmerung is a dramatic study in disappointment. The first act opens with the Norns (Ronnita Miller, who also sings the fateful and prophetic Erda, Jamie Barton and Sarah Cambridge), who weave the future. Tangled in yards of computer cable, a poisonous green motherboard projected across the stage’s scrims, the Norns predict and grieve over the inevitable fall of Valhalla. 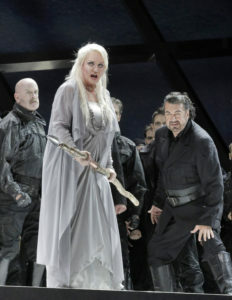 Iréne Theorin as Brünnhilde vows revenge, while Hagen (r. Andrea Silverestelli) looks on, plotting against Siegfried. Photo by Cory Weaver. The splendid tone poem of Siegfried’s journey down the Rhein as he sets out on his heroic adventures shows off the fine skills of the orchestra’s brass section, with eight French horns, alternating a bright brassy sound with a subtle blend that bordered on the tender and evoked a grandeur seen in the vast aerial panoramas of the river projected across the stage. At last, we find ourselves in the home of the scheming Gibichung family to witness the unraveling of the world and the gods’ demise. Hagen, Alberich’s son, is sung by Andrea Silvestrelli, who clearly delights in his role as Siegfried’s assassin. But Hagen is only the final moment in a process that began with Alberich’s theft of the river’s gold from the Rheinmaidens. When we see the river nymphs in Götterdämmerung they are nature despoiled, their dresses muddy and tattered, the river choked with plastic bottles and sacks of trash. It is only with the death of Siegfried followed by Brünnhilde’s immolation on his funeral pyre that nature can be returned to its pristine beginnings. As flames spring up from the guns, tires and trash that the Gibichung women have heaped onto Siegfried’s funeral pyre, the Ring and its gold return to the Rheinmaidens. Brünnhilde’s sacrifice renews the world, and nature is reborn in the form of a small tree. In a letter to Franz Liszt, Wagner wrote, “The love of a tender woman has made me happy; she dared to throw herself into a sea of suffering and agony so that she should be able to say to me ‘I love you!’ … as a consequence I am redeemed and she is blessedly happy because she is aware of it.” Despite endless analyses of Wagner’s politics, his words suggest the basis of his work was more personal. Luckily for us, his ambitions and talents were monumental. The San Francisco Opera House presents two additional Ring Cycles beginning on Tuesday June 19 and Tuesday June 26. For information and tickets, visit sfopera.com.